With all the obvious European City Break destinations ticked off the list, I’m all about seeking out the lesser-known options now. 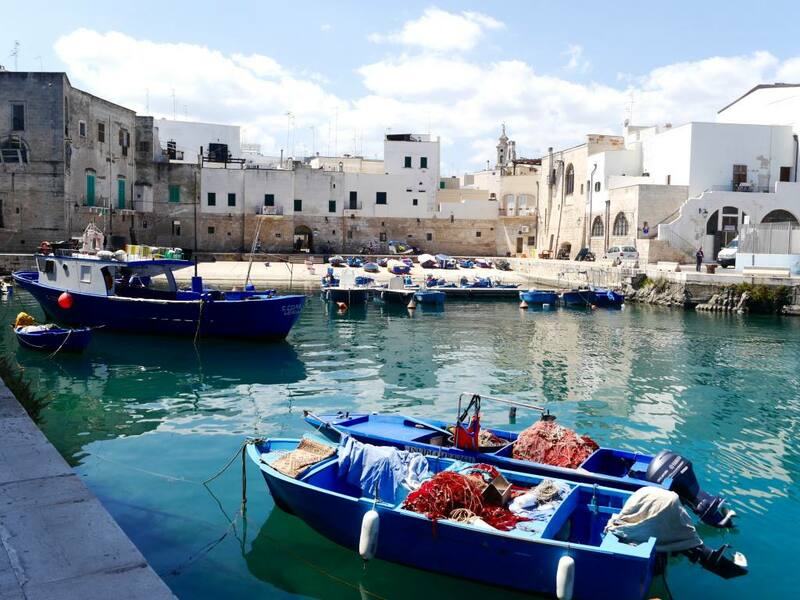 If you dare to go a little more ‘off-piste’, you can often end up in a city with double the charm and half the crowds. 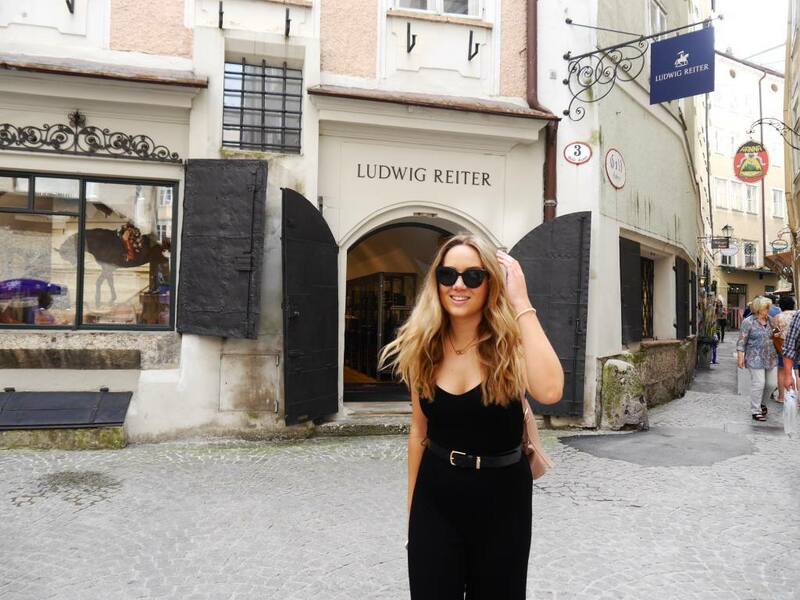 If Vienna is Austria’s famous Plan A, then Salzburg is most definitely its lesser-known Plan B. I got to spend two nights and one full day in Salzburg as part of my 5-day Austrian adventure which took me through Graz, Salzburg and Innsbruck. I immediately fell in love with Salzburg, so much so that I wanted to dedicate an entire blog post to it. 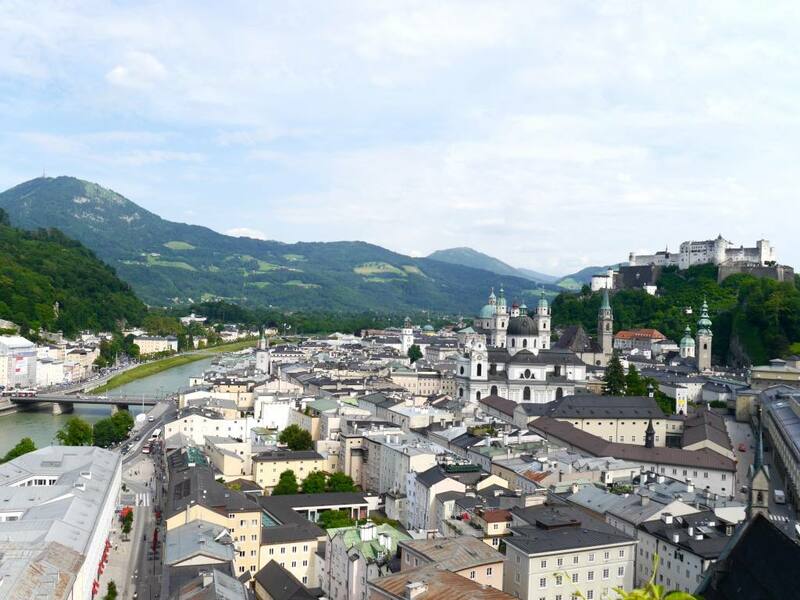 So here are 11 reasons to plan a city break to Salzburg. 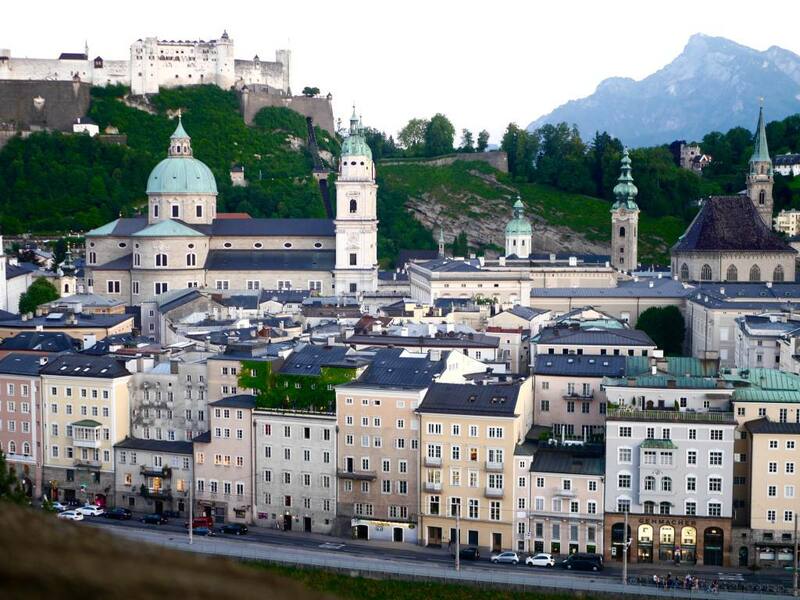 Salzburg is famous for being the birthplace of the famous composer Mozart. Because of this, Salzburg has become somewhat of a mecca for classical music and you can feel Mozart’s influence all around the city. The streets are alive with beautiful live music and there are talented musicians around every corner. You’ll often see Music students rehearsing in the street and violinists and harpists fill the historical squares with music. Even if you don’t think classical music is your thing, you can’t help but appreciate it in such spectacular settings. I remember my guide saying, “Although Salzburg is the fourth largest city in Austria, it can never grow in size”. I love small cities, so I loved this fact. Salzburg is dramatically framed by snow-capped mountains, which means the views are spectacular at every angle of the city. It also means that the mountains are right on your doorstep, so you can combine a day in the city with a day of adventure along one of the many hiking routes. Salzburg locals take to the mountains every weekend to hike, bike, run or ski depending on the season. Although most people may consider Salzburg to be a winter break destination, I can confirm that it’s incredible in summer too. 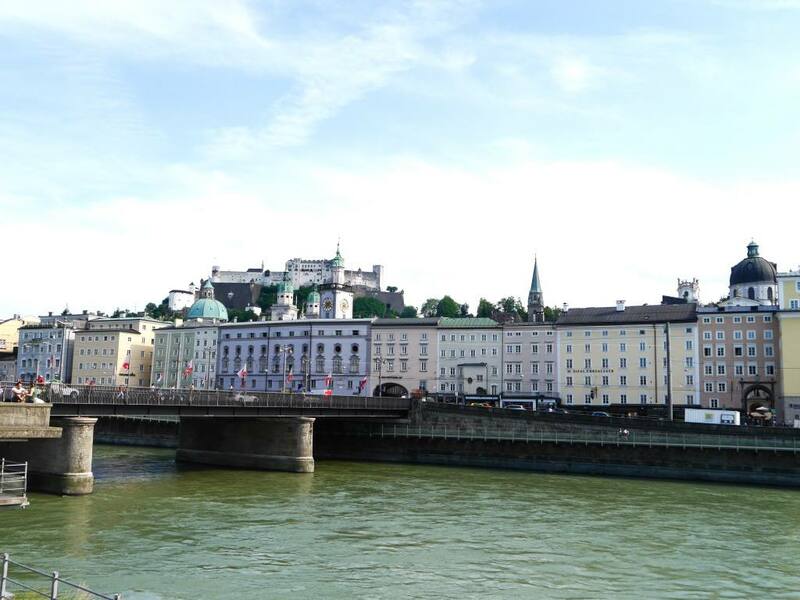 I visited Salzburg in June when the skies were blue and the weather ranged from 26-28 degrees. The surrounding mountains were lush and green, I got to see the famous Mirabell Gardens in full bloom and enjoy the al fresco culture. I would love to return again in winter to enjoy the Christmas market and see the festive lights. I can imagine it to feel even more magical. 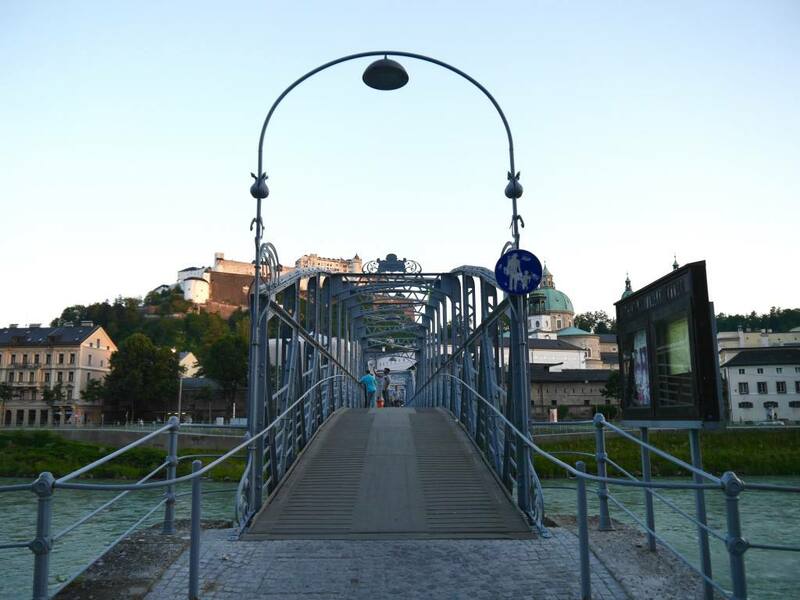 If, like me, you are a Sound of Music fan you will find it fascinating to see all of the filming locations dotted around Salzburg. 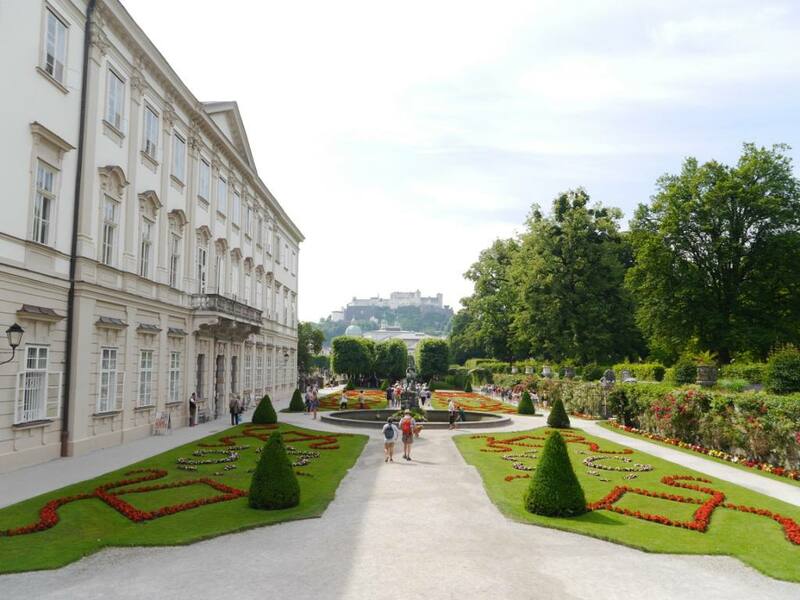 Super fans can go on The Original Sound of Music Tour with runs daily from 9.30am to 2.30pm. 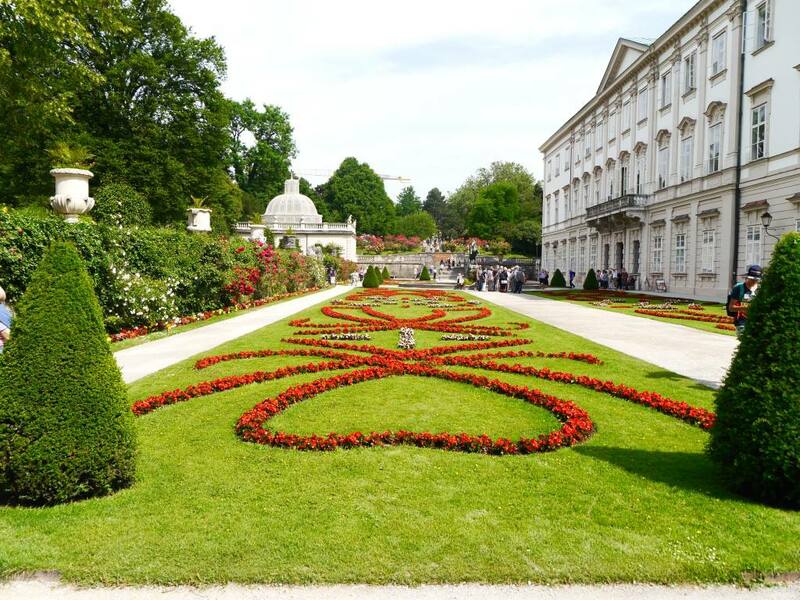 The official tour takes you to the filming locations a little further out of the city but there are plenty of filming spots you can independently find on foot and in the heart of the city such as the Mirabell Gardens. 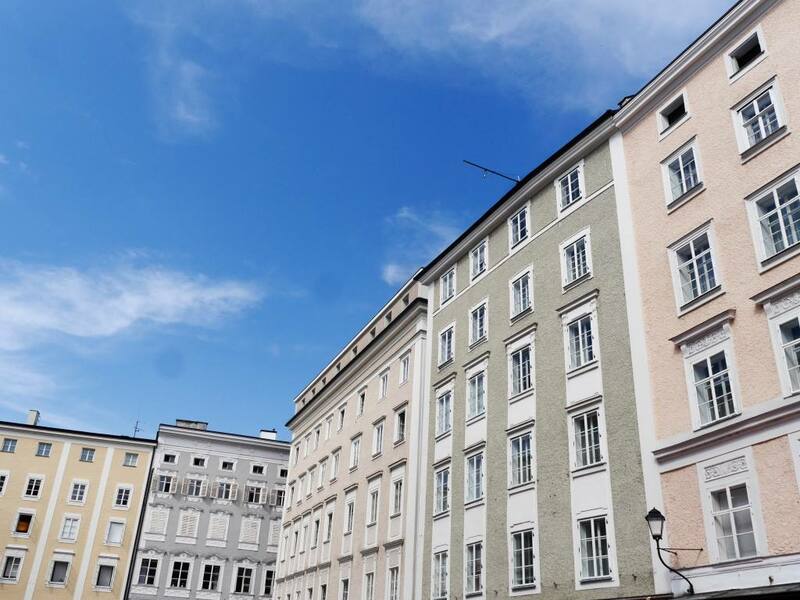 If you’re a sucker for pretty buildings and baroque architecture, you will be in heaven in Salzburg. When exploring the city, always remember to look UP to appreciate the perfectly preserved and historical baroque architecture. 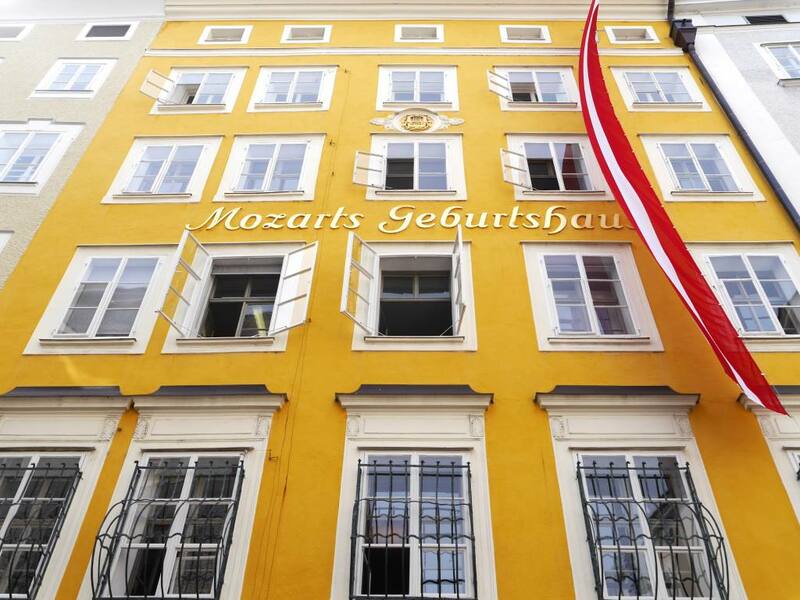 Mozart’s famous birthplace building is bright yellow and the iconic pastel buildings along the riverfront provide the perfect photo opportunity. 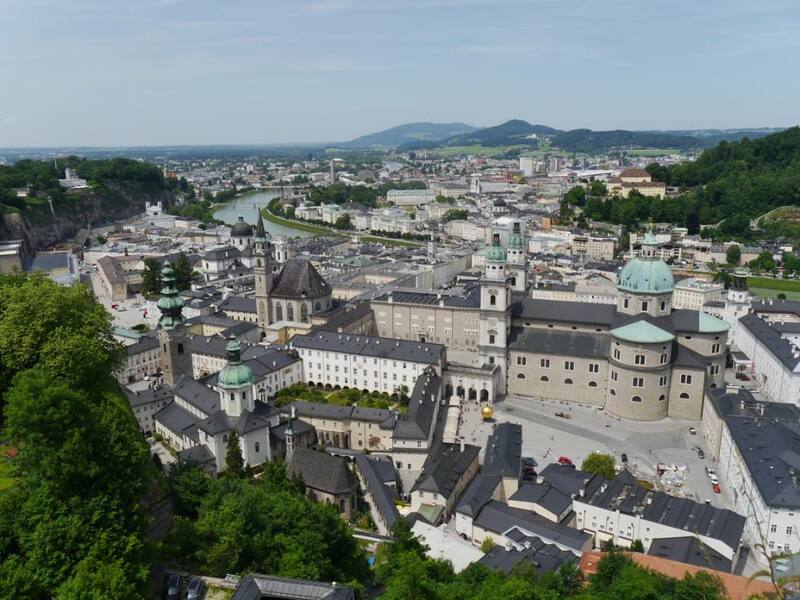 The best way to see Salzburg is from above and there are plenty of viewpoints to get your bearings. The Hohensalzburg Fortress towers over the city below and has some spectacular vistas of Salzburg. On one side there’s a stunning birds eye view of the city and on the other there’s a mountain panoramic. Head up to the Museum of Modern Art for another perspective of the city, where you can stop for lunch or coffee with a view at M32 Restaurant. 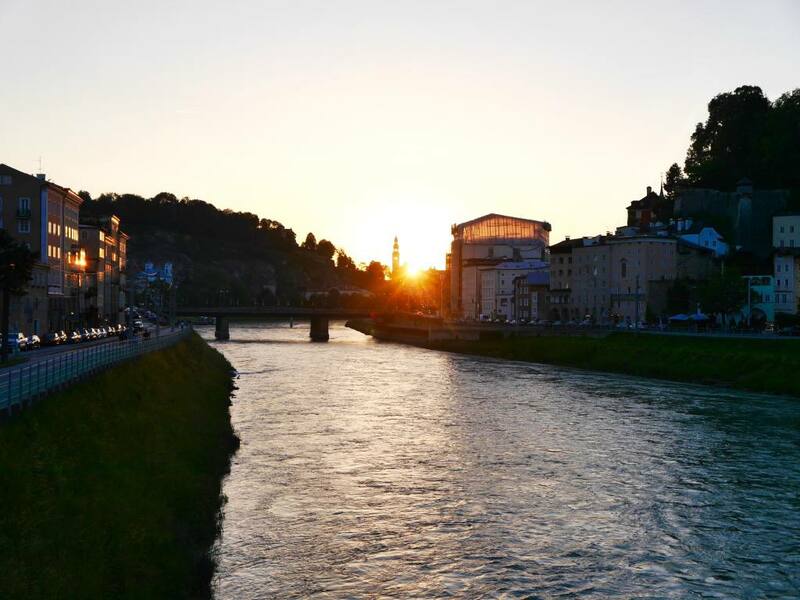 Along with the music-filled streets and quaint architecture, Salzburg also has other qualities that make it incredibly romantic. Thousands of coloured ‘love locks’ decorate the modern Makartsteg Bridge and horse and carriage rides operate through the pedestrian-only parts of the city. 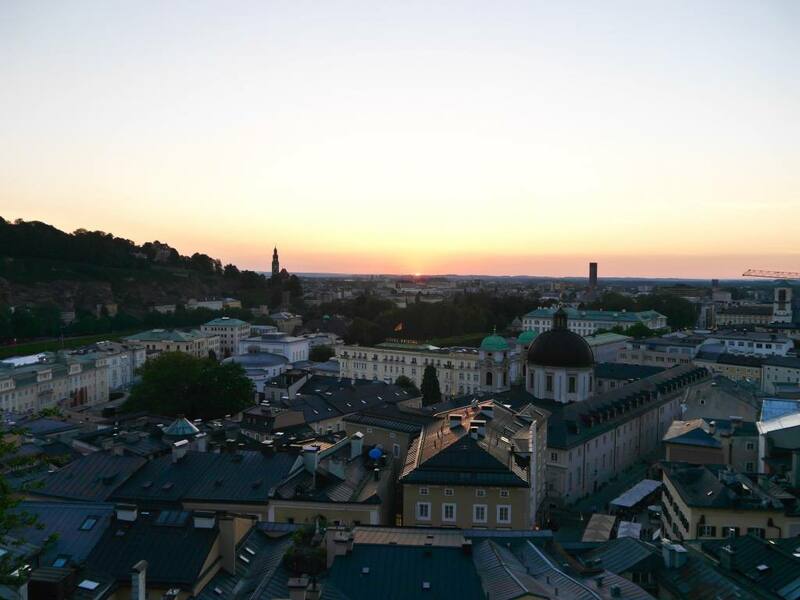 Salzburg is also known for its romantic pink sunsets which draws in quite a crowd at the top of the Imberg Steps close to Kapuzinerberg Monastery. Couples and friends make the climb to see a pink panorama of the city below. Austrian cuisine is surprisingly delicious and incredibly fresh. 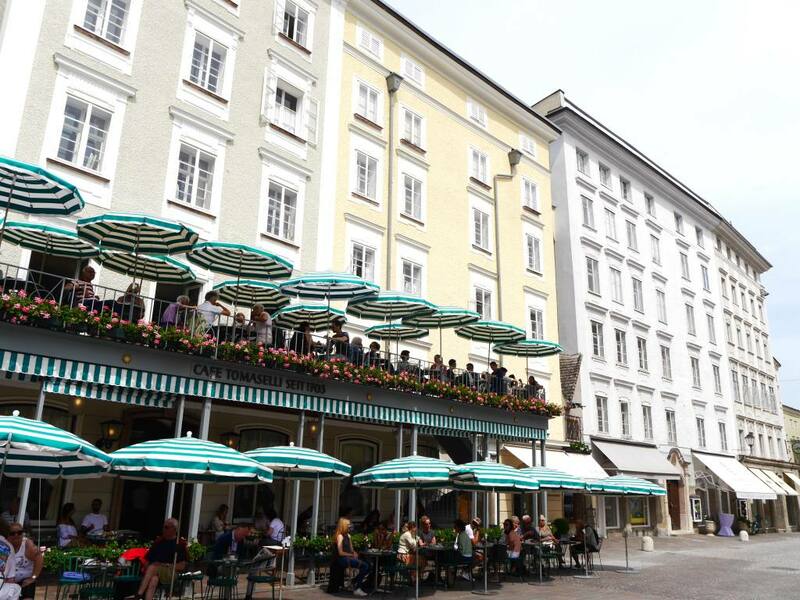 Salzburg is home to some incredible restaurants but as it’s a city filled with tourists, it pays to do your research. 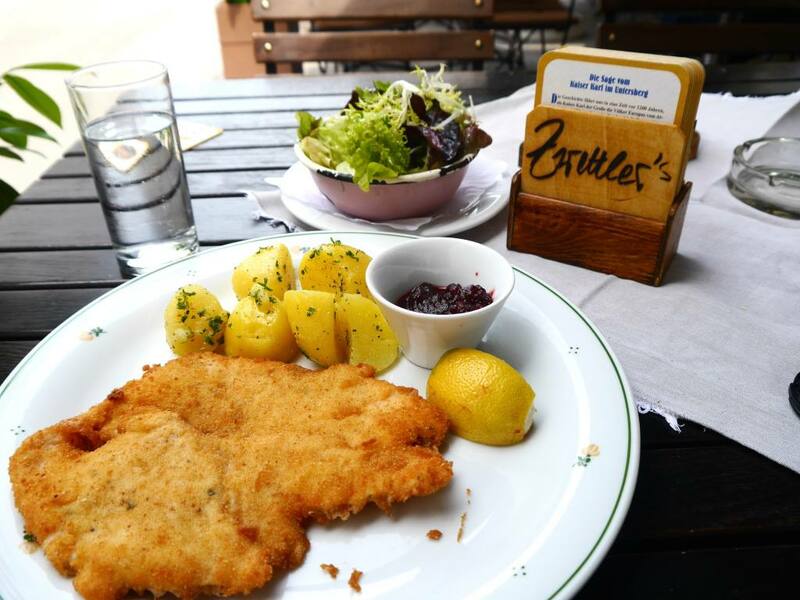 Be sure to check out Zwettler’s on Kaigasse 3 for the best Schnitzel in town and head to local’s favourite Paul Stubm on Herrengasse 16. This hidden Biergarten is tucked away on a narrow alleyway and is the Austrian’s version of a pub. 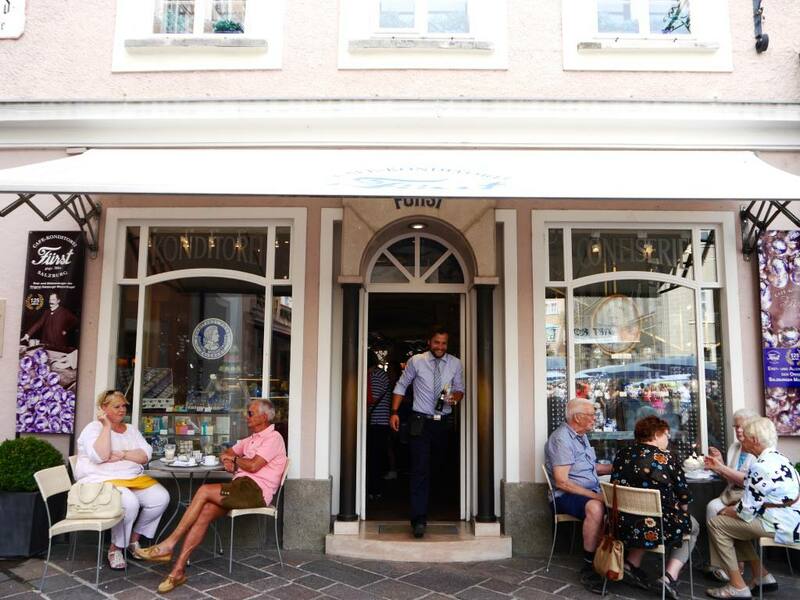 It serves a full menu of delicious food as well as signature Austrian drinks like Aperol Spritz and “The Hugo” (a refreshing cocktail of prosecco or wine with elderflower cordial , mint and soda water). 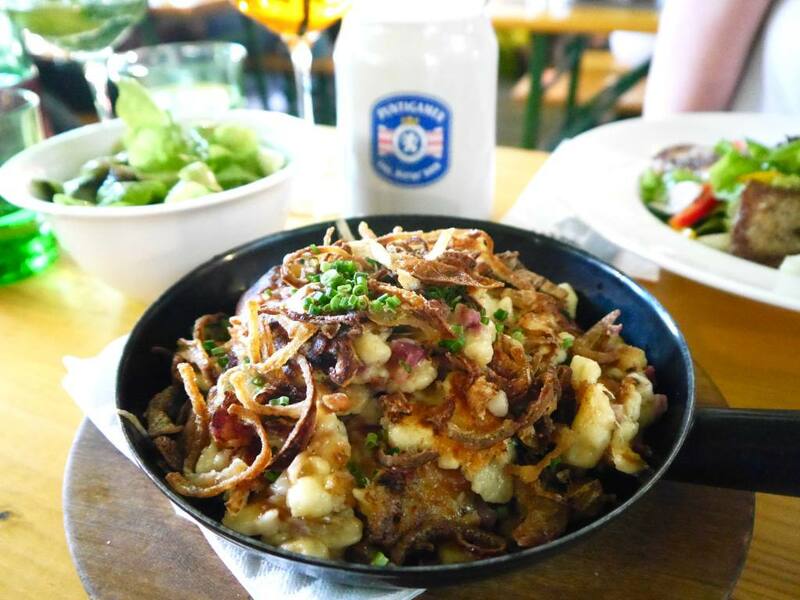 For an indulgent lunch or dinner, order the Spaetzle topped with onions and bacon. It’s like the Austrian version of Mac ‘n’ Cheese. Even if you plan a city break to Salzburg in the summer months, you can still get a taste of Christmas magic at the zany Christmas Museum. The Salzburger Weihnachtsmuseum is open all year round and is dedicated to all things Christmas. What’s not to love about that? Another tradition that is embraced in Salzburg is the Austrian dirndl, which simply translates to ‘dress’ in English. The dirndl is typically made up of a white blouse, buttoned up dress and a colourful apron. Women still proudly wear their dirndls today and the streets become a catwalk to show them off. They’re usually worn for special occasions but some women still like to wear them in every day life. 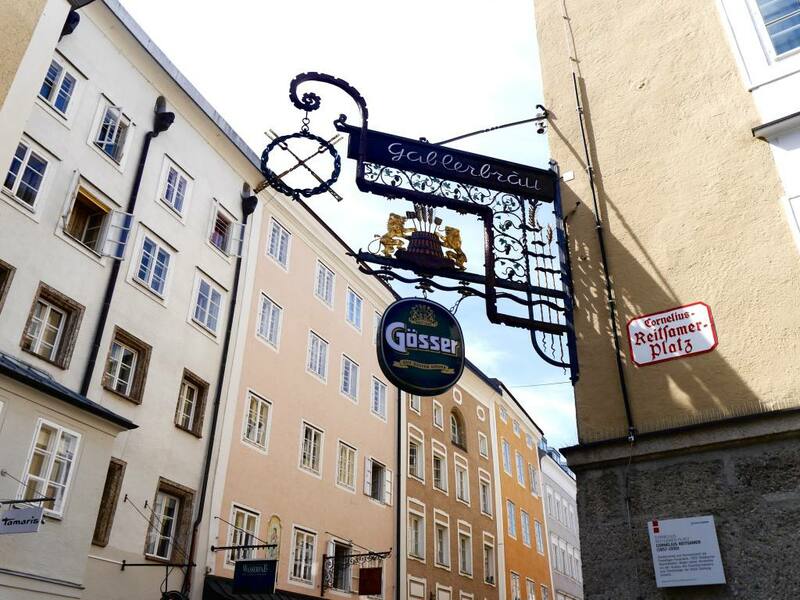 Be sure to check out the luxurious Dirndl boutiques on Getreidegasse and the Waagplatz where local women go to have their dirndls tailor-made. These little chocolate treats have become somewhat of an emblem of Salzburg. 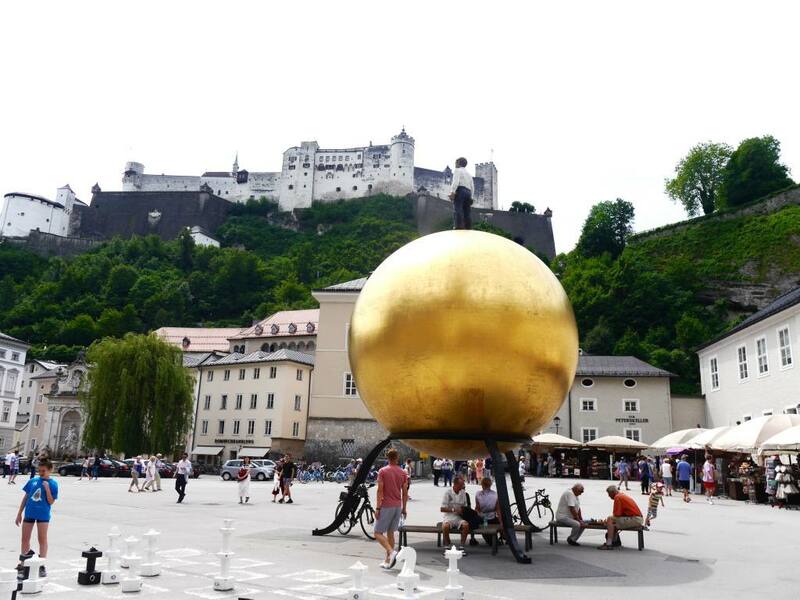 So much so that people speculate that the golden ball sculpture in the Kapitelplatz is supposed to represent them. The Mozart Balls were created in 1890 by Salzubrg confectioner Paul Fürst and are made of pistachio, marzipan and nougat then covered with dark chocolate. Salzburg is the only place in the world that you can buy them, including at the famous Fürst café. 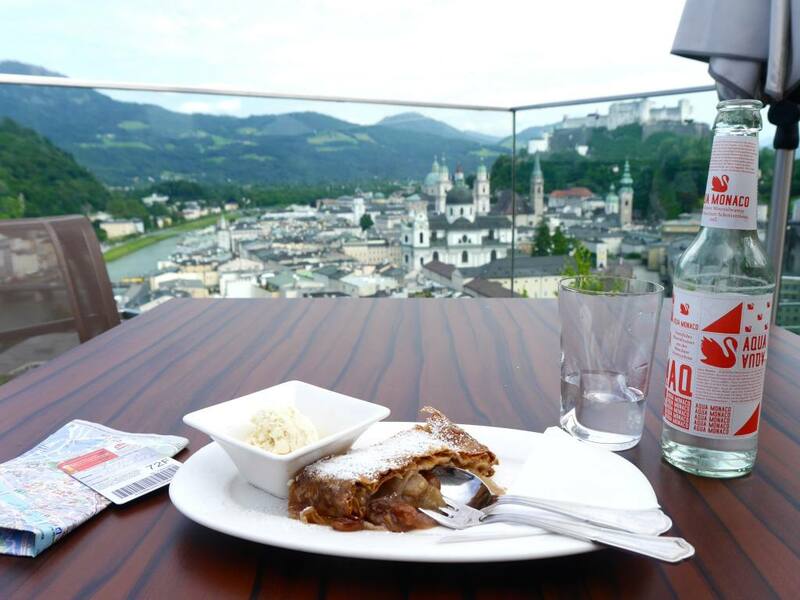 If you’re thinking of planning a city break to Salzburg, it’s a great option to buy a Salzburg card. 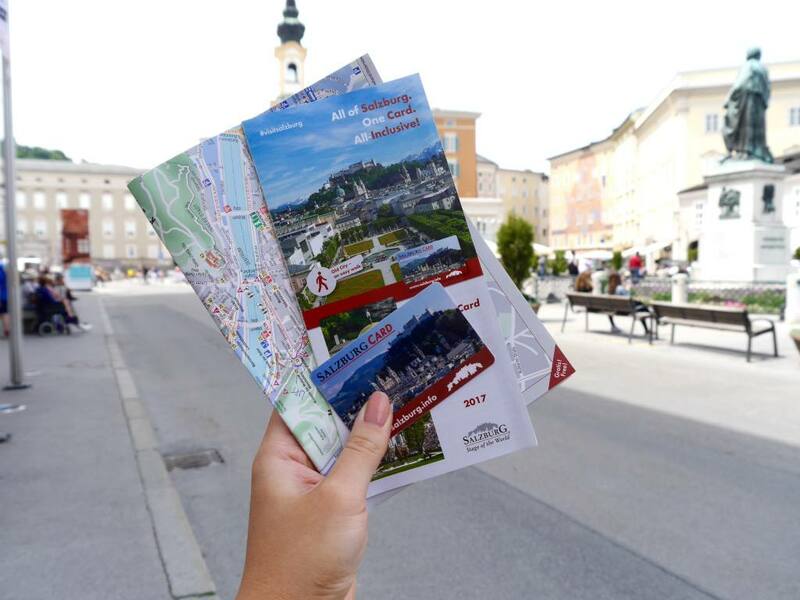 The card gives you all-inclusive one-time access to all of Salzburg’s top tourist attractions, museums and public transport (including a river tour and the funicular). The card is available for 24, 48 or 72 hours. This blog post has been sponsored by Visit Austria as part of the #UncoverAustria campaign. All photos, recommendations and views are my own. Thanks, haha! How did you like Innsbruck compared to Salzburg? I read as many opinions as possible before choosing Salzburg. Seems a little more scenic. I would love to go to Salzburg one day. It looks amazing with the great views! It looks like the perfect destination for a city break! My brother is currently living in Vienna and so I’m really hoping to go visit him over the Summer, I’m definitely going to try and tag on Salzburg for a few days!! I am a Salzburgerin living in the US. Nice review of my hometown. Very informative! I like the post! Thanks! Love this! We visited Salzburg during the Christmas season a couple years ago and had a blast. Seriously one of my favorite places! Umm..Christmas museum?! Sounds fab!! I really want to visit, Salzburg looks super cute! I love Salzburg (been three times!) and it always confuses me that more people haven’t considered visiting! The Mirabell Gardens are gorgeous and I love the views from the fortress. Not a fan of Mozart Balls unfortunately but they do make a good gift for people back home.